The flea season is now here and if you havn't already got a flea program in place then now is the perfect time to get started. 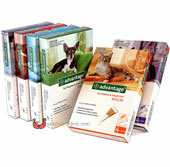 To help you protect your furry friends we are offering 5% off all of our 12 packs of flea treatment for this month only. So get your order in and avoid facing a flea infestation as the weather warms up. Click here to view our range of flea products for dogs. Click here to view our range of flea products for cats.